Cough is a protective reflex to prevent aspiration and can be triggered by a multitude of stimuli. The commonest form of cough is caused by upper respiratory tract infection and has no benefit to the host. The virus hijacks this natural defence mechanism in order to propagate itself through the population. Despite the resolution of the majority of cold symptoms within 2 weeks, cough can persist for some time thereafter. Unfortunately, the mechanism of infectious cough brought on by pathogenic viruses, such as human rhinovirus, during colds, remains elusive despite the extensive work that has been undertaken. For socioeconomic reasons, it is imperative we identify the mechanism of cough. There are several theories which have been proposed as the causative mechanism of cough in rhinovirus infection, encompassing a range of different processes. Those of which hold most promise are physical disruption of the epithelial lining, excess mucus production and an inflammatory response to rhinovirus infection which may be excessive. And finally, neuronal modulation, the most convincing hypothesis, is thought to potentiate cough long after the original stimulus has been cleared. All these hypotheses will be briefly covered in the following sections. There are three metrics which are used to study cough: cough challenge, cough counting, and subjective end points such as visual analogue scale or quality of life. Cough challenge studies include the use of pro-tussive agents, such as capsaicin and citric acid, which stimulate transient receptor potential (TRP) ion channels to induce cough.16–18 TRP channels have been popularised as pro-tussive irritant receptors.19 ,20 However, on account of repeated clinical trial failures in patients with chronic cough using both cough counting and subjective measures, TRPV1 and A1 antagonists as anti-tussives have failed to reach the clinic,21 and an unpublished RCT of inhaled TRPA1 antagonist GRC 17536 (personal communication AHM, 2015). A recent shift of focus now proposes that other channels and receptors, such as P2X receptors, different TRP channels including TRPV4 and TRPM822–24 may be responsible for the observed hypersensitivity. It seems unlikely that one single channel, or receptor, is responsible for causing cough hypersensitivity in all participants in cases of postviral and chronic cough. Research into URTI and cough faces many problems. Research which relies on natural infection of human volunteers is open to a range of uncontrollable variability including incubation time and causative agent (virus genus and serotype). There is also a lack of suitable animal models for studying HRV due to high host specificity of attachment receptors. Major group HRV requires human ICAM-1 receptor25 which is not present in guinea pigs, an animal classically used for studying the cough reflex. However, pathogens such as parainfluenza virus, a rarer cause of the common cold, can infect guinea pigs and produce a postviral cough with a hypersensitive airway response to capsaicin.26 As a result, studying the effects of HRV infection is often carried out in vitro using cell systems. There is a plethora of research into viral induced effects characterised from various respiratory cell lines, leading to a variety of proposed mechanisms for the induction of cough. HRV infection results in the production a broad profile of inflammatory mediators in the host. The primary inflammatory cytokines reported in HRV infection are interferon (IFN), interleukin (IL) 1, IL-6, IL-8, tumour necrosis factor (TNF) α, granulocyte-macrophage colony-stimulating factor and RANTES. The infection leads to massive upregulation,27 and, consequently, it is often described as a ‘cytokine disease’.28 Many symptoms are thought to occur as a result of the effects of inflammatory cytokines releasing of mediators. For example, sore throat may occur as a result of the release of bradykinin.29 The role of these endogeneous mediators is discussed below. Tachykinin peptides, neurokinin A and B, and substance P, are inflammatory neuropeptides, which collectively induce airway hyper-responsiveness, bronchial constriction,37 and increased vascular permeability.38 They also generate substantial mucus secretion39 and the secretion of inflammatory mediators from immune cells.40–42 It has been suggested that inhibition of tachykinin metabolism by ACE inhibitors is an alternate mechanism for ACE inhibitor cough.43 In HRV infection, tachykinins are released from neurons on TRPV1 activation.40 Unfortunately, the mechanism underlying this activity is currently unknown, and understanding such channel interaction may hold the key to modulating the development of viral and postviral cough. Reduction of degradation of tachykinins by neutral endopeptidases in respiratory viral infection44 are likely to enhance the noxious effects of tachykinins. Despite its scarcity, substance P in humans has been found to be upregulated, both in nasal epithelium and plasma in chronic cough sufferers.45–47 The efficacy of substance P, mediated by tachykinin NK-1 receptors,48 is greatly enhanced by prior inflammation. Furthermore, when in excess, it is suggested to lower the threshold of pain perception to noxious stimuli, as demonstrated in several pain-associated disease states.49 ,50 In guinea pigs, the role of substance P in cough has been extensively investigated. Substance P results in bronchoconstriction but highly variable cough.51 Likewise, in healthy individuals, inhalation of substance P does not cause cough. However, at the same concentration, substance P has the ability to elicit cough in patients with common colds,52 suggesting a hypersensitive state induced by the virus. Additionally, the microvascular leakage of substance P is thought to activate rapidly adapting receptors (RARs)53 which may add to the irritant effect in common cold. Evidence for the role of another neuropeptide calcitonin gene-related peptide (CGRP) is mixed. TRP channel (TRPV1) activation induces and controls the release40 ,54 from C-fibre terminals.55 CGRP has an inhibitory effect in substance P-induced bronchoconstriction,56 and when deficient, causes airway hyper-responsiveness.57 However, an increase in CGRP has been shown in many pain-associated conditions, including migraine and various forms of inflammation.58 ,59 Chronic cough sufferers have been shown to have increased neuronal levels of CGRP60 ,61 associated with the enhanced sensitivity to capsaicin.61 These effects appear to be mediated through the cytokines, IL-1β and TNF-α.59 In respiratory syncytial virus (RSV) infection, a rarer cause of URTI in the adult, the development of airway hyper-responsiveness appears to arise through a disruption of CGRP balance.57 ,62 However, this fails to explain the increased levels found in sufferers of chronic cough. Unlike substance P, CGRP does not directly induce mucus secretion,63 but may indirectly enhance through vasodilation. Many of the inflammatory mediators discussed above do not directly evoke cough but work synergistically through other pulmonary fibres where the threshold for cough is lowered to provoke the urge to cough. Thus, this change to sensory nerve functionality secondary to these mediators may potentiate and prolong a cough response during and after respiratory viral infection. By comparison with other respiratory viruses such as influenza, HRV is renowned for its minimal cytopathic effects.86 It has been suggested that influenza has a higher incidence of cough than that seen with HRV infections.87 Thus, physical disruption of airway integrity may be a factor in a heightened cough response. HRV, or synthetic dsRNA stimuli polyinosinic:polycytidylic acid (poly(I:C)), is able to disrupt airway epithelial cells via disruption of tight junction complexes at apicolateral membranes through dissociation of zona occludin (ZO) 1, occludin, claudin-1, E-cadherin and β-catenin. This leads to a significant reduction in transepithelial resistance88–90 indicating a loss of epithelial integrity (figure 1A). Transepithelial resistance can also be decreased through respiratory-localised TRPV4 activation,91 and causes disruption of tight junction complexes leading to increased permeability. But whether these are related or not, are unknown. Whether this viral induced loss of integrity is dependent or independent of an inflammatory response is open to debate. (A) Normal healthy airway barrier. In a healthy airway, cells are connected together by tight junction complexes including tight junctions, adherens and gap junctions. Cells are attached to basement membranes by hemidesmosomes and focal contacts. Barrier permeability is minimal and tightly regulated to prevent the excessive release of essential molecules, ions and proteins. The barrier is protective against infection. (B) Human rhinovirus infection in airway epithelial cells. There are two main ways that HRV causes physical disruption of airway barriers, inflammatory-dependent and independent. Both replicating and non-replicating viruses can interfere with airway membrane integrity by disrupting tight junction complexes. This causes a reduction of transepithelial resistance with the potential consequence of contracting a secondary infection. Cytoskeletal remodelling mediated by protein kinase D (PKD) causes an actin reorganisation within infected cells, altering their structure and integrity, further allowing cells to lose their adjoining contacts. Replicating HRV produces a dsRNA intermediate structure which can interact and activate NOD-like receptor X-1 ultimately producing reactive oxygen species. These alone are capable of reducing transepithelial resistance and barrier disruption. Loss of gap junctions and cells leaves gaps within epithelial layers. These allow cytokines, growth factors, immune cells and further viral particles to penetrate deeper layers within the airways, causing dysregulation of cellular signalling. This dysregulation causes further upregulation of various molecules including growth factors, which, in turn, can lead to an increase of receptor expression, such as transient receptor potential channels which have a prolific effect to cause cough (TNF, tumour necrosis factor; IFN, interferon; IL, interleukin). ROS and other oxidants cause barrier disruption and affect permeability in tissues throughout the body92 through cytoskeletal and tight junction interruption. This effect is mirrored in polarised epithelial cells, such as those within the airways.88 ,93 During infection, HRV causes oxidative stress independent of viral replication or ICAM-1-mediated viral attachment.94 The mechanism is thought to be via a NOD-like receptor X-1 (NLRX-1) interaction with dsRNA causing a translocation of NADPH oxidase-1 (NOX-1) leading to the generation of ROS and oxidants.93 ,95 By contrast, ROS production is necessary for clearance of viral infections, but requires stringent regulation. Interaction with dsRNA receptor NLRX-1 induces mitochondrial ROS generation.96 ,97 This is likely a result of mitochondrial antiviral signalling protein interaction with dsRNA,98–100 an important component of HRV lifecycle.101 ROS are also potent agonists of TRPA1 and TRPV1,75 ,76 which poses a potential interaction route between HRV and TRP channels. Other investigators propose that physical disruption is an inflammatory-dependent process caused by TNF-α, IFN-γ, IL-4 and IL-8 which mediate the tight junction dysregulation.102–104 A cytokine-induced effect may, however, be secondary to signalling pathways aforementioned, and which mechanism predominates may be dependent on specific cell type. Consequently, varying degrees of barrier disruption and physical damage have the potential to cause a multitude of effects. A loss of integrity to airway barriers enables the transmigration of opportunistic bacteria causing secondary respiratory infection.90 It can also lead to dysregulation of intracellular signalling facilitating the upregulation of growth factors.105–107 Finally, in exposed animals, an enhanced activation of sensory nerve fibres leads to airway hyper-responsiveness108 and epithelial repair is delayed.109 Thus, there is a cycle of cytokine-induced barrier damage (figure 1B) leading to epithelial shedding. Airway epithelial lining begins to become permeable to larger molecules88 leading to a cycle of hypersensitivity and further damage. Physical disruption to airways described above is a well-characterised part of the pathophysiology of lung diseases including asthma and cystic fibrosis, but the role it plays in URTI, such as HRV, has only recently begun to become clear, but may be crucially important in patients with pre-existing respiratory disease. Excessive mucus production and secretion is common in URTI1 ,110 initiating symptoms such as a cough and sneezing, and thus facilitating transmission of infection.3 ,111 HRV, in particular, upregulates the transcription of various mucin genes including MUC5AC.112–114 This pathway is particularly involved in mucus production and release, but this complex process (figure 2) has yet to be completely characterised. Using nuclear factor (NF) κB and mitogen-activated protein kinase inhibitors, the pathway induced during HRV infection was originally identified. The mechanism is independent of serotype and genotype and is inducible by artificial genomic stimulus using poly(I:C).112 NFκB is upregulated as part of HRV lifecycle,115 ,116 so it is unsurprising that it plays a pivotal role in the production of symptoms during infection, and is essential for MUC5AC production. HRV is able to induce mucosal cell metaplasia through a novel TLR3-epidermal growth factor receptor (EGFR) coupling and the induction of EGFR ligands,113 including transforming growth factor α. This results in the production and secretion of mucins via MUC5AC promoter regions.112 The process of mucus secretion and tight junction disruption go hand in hand. A loss of epithelial integrity where a dissociation of E-cadherens from adherens tight junction complexes causes the uncoupling of EGFR where it becomes readily activated. However, an excess of EGFR activation promotes goblet metaplasia and, thus, excessive mucus secretion.117 Muscarinic receptors are also involved in mucus secretion, mediated predominately through M3 in cooperation with M1118 and are regulated by M2.119 Since stimulation of muscarinic receptors transactivate EGFR to stimulate goblet cell mucus secretion,120 ,121 it is possible that HRV possesses the ability to interact with muscarinic receptors to cause this process. The implications of this are far-reaching as not only may it begin to explain the aetiology of a viral mucosal cough but also chronic mucus secretion such as occurs in chronic bronchitis. Sterile-α-motif-pointed domain ETS-factor (SPDEF) and epidermal growth factor receptor (EGFR) regulation of mucus production and goblet cell metaplasia within the airways during upper respiratory tract infection (URTI). Reactive oxygen species (ROS)-induced uncoupling of EGFR permits its translocation to the apical membrane of cells which readily allows its activation. Excessive activation of EGFR promotes various cellular processes including goblet cell metaplasia and upregulation of mucus-associated genes including MUC5AC. Simultaneously, SPDEF is activated to dampen the inflammatory response mounted against the rhinovirus infection through blockade of TLR signal transduction. 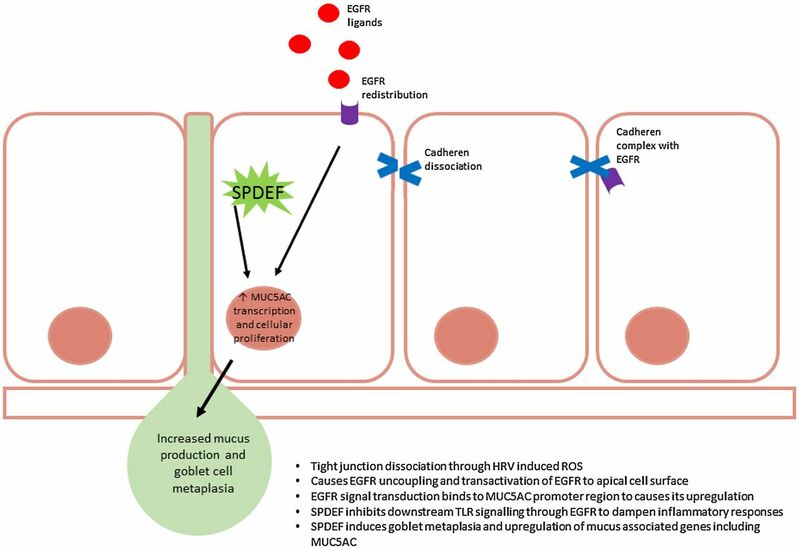 SPDEF also functions as a transcription modulator and causes upregulation of MUC5AC. Ultimately, increased MUC5AC and goblet metaplasia results in the hyperproduction of mucus, characteristic of rhinovirus infection. A counter-regulatory mechanism to HRV-induced TLR-EGFR coupling is by induction of the transcription factor sterile-α-motif-pointed domain ETS-factor (SPDEF). SPDEF inhibits TLR signalling and type I IFN release to dampen the proinflammatory response induced by HRV.122 SPDEF is a transcriptional modulator with a wide variety of roles including endocrine and androgen interaction,123 ,124 however, recently this transcription modulator was found to regulate goblet cell metaplasia123 ,125 and upregulate genes associated with mucus production,126 including MUC5AC.125 It has been suggested that SPDEF initiates recovery and protects against excessive inflammatory damage during metaplasia. Dysregulation of this pathway may permit the cycle of cough and damage to persist, exposing basal membranes and nerve fibres, allowing HRV-induced physical damage and mucus overproduction to act synergistically. Cough is clearly a neuronal reflex, so the hypothesis that neuronal modulation underlies the pathogenesis of viral cough is the most convincing. However, at present, there is no single comprehensive mechanism which explains cough induced by HRV or indeed any other respiratory pathogen. Theories include a cooperative role of pulmonary oxidative stress in vagal sensory nerves between TRPV1, TRPA1 and P2X receptors.146 Direct viral damage to mitochondria leading to ROS production may modulate or influence cough. Phenotypic changes imply altered gene expression and differentiation. In the guinea pig, low threshold mechanosensitive sensory nerves express TrkA,153 and application of other growth factors induce the functional expression of TRPV1 and TRPA1 de novo.152 In vivo research in the rat and guinea pig models have found inflammatory states through increased nerve growth factor (NGF) levels causing a phenotypic change of A-delta fibres. They now resemble C-fibres as shown by the coexpression of substance P and NGF.154 ,155 NGF is transported to sensory neurons via DRG and is able to alter transcription of various proteins and peptides.156 Further research into the effect of NGF on TRPV1 by Chuang et al33 and Ganju et al157 found that NGF activates the PLC pathway. TRPV1 associates with phosphatidylinositol 4,5-bisphosphate (PIP2) in its resting state, but PLC activation causes the hydrolysis of PIP2 to release TRPV1 from constitutive inhibition, thus increasing the opening probability of TRPV1. Similarly, HRV infection in the human has been shown to cause the upregulation of a number of growth factors.105–107 Specifically, HRV can induce the upregulation of NGF158 and inhalation of aerosolised NGF can enhance cough in the guinea pig citric acid-induced cough model through TRPV1 and TrkA (NGF receptor) activation.159 ,160 Despite the differences between human and guinea pig airway innervation, it is these modifications in expression that may lead to a phenotypic change during URTI. Interest into the role of TRPV4 and P2X receptors in cough has been growing exponentially. A recent abstract publication showed that the application of a TRPV4 agonist facilitated the subsequent activation of P2X3 receptor through sensitisation of airway sensory nerves.161 This is not the first time TRPV4 and P2X3 receptors have been hypothesised to play a cooperative role in pathophysiology.162 It has become apparent that there is significant overlap between TRP channel and purinergic receptor functionality, which have given rise to the persuasive theory that TRPV4 and purinergic receptors play a cooperative role in pathological cough. ATP, which has been shown to enhance cough reflex sensitivity24 in response to citric acid and histamine challenge,163 potentiates through P2X2/X3-mediated bronchoconstriction.164 ,165 A successful clinical trial using AF-219, a P2X3 antagonist, reduced the incidence of coughing in patients with chronic cough by 75%,166 provides more convincing evidence that cough sensitivity may be strongly upregulated by the P2X pathway. Neurogenic inflammation from afferent sensory neurons167 is mediated mostly, but not exclusively, by neuropeptides CGRP, neurokinins and substance P. When present, it is thought to be a protective reflex, facilitating healing and modulation of local immunity. Unfortunately, there is wide interspecies and, in man, intersubject variability in afferent sensory innervation making interpretation of experimental findings difficult to translate into clinical relevance. However, neurogenic inflammation is well characterised in several diseases, including migraine,168 and more controversially in asthma169 and rhinitis, the latter of which is common in URTI,170 where it likely amplifies maladaptive responses. Neurogenic inflammation is essential for sensory neurons to prime and respond to noxious stimuli quickly. Consequently, afferent neurons are abundant in TRP channels, P2X, PAMPs and DAMP receptors. Only a limited set of TLRs, 3, 4, 7 and 9, are present within nociceptive neurons,171–173 therefore, not all pathogens are capable of directly causing neurogenic inflammation. Stimulation of these TLRs induce an inward depolarisation to elicit neuronal sensitisation to pain stimuli.171–173 A recent interesting finding identified TLR 7 stimulation leading to an itch-specific sensory pathway,173 through intracellular microRNA let-7b. This, in turn, induces a rapid inward current in neurons, coexpressing TLR7 and TRPA1 to generate pain.174 ,175 Extracellular ATP is a crucial damage-associated molecular pattern molecule ligand which is released during damage and injury. In nociceptive neurons, P2X3 receptors are key to ATP recognition and pain production.176 Purinergic receptor P2Y2 is also responsive to ATP, and is capable of TRPV1 sensitisation and activation in the absence of TRPV1 stimuli,177 a similar sensation previously ascribed to TRPV4 through HRV-induced mucus overproduction. Cytokines, namely IL-1β and TNF-α, produced as a result of infection cause TRP channel sensitisation and activation through membrane phosphorylation.178 ,179 The resultant effect means that TRP channels respond to innocuous stimuli as noxious stimuli causing allodynia and, perhaps, allotussia. The role of TRP channels in HRV-induced cough has recently been explained in a first-of-its-kind study by Abdullah et al.195 A novel infection site of HRV was identified in neuronal cell lines with concomitant upregulation of expressed TRP channels TRPA1, TRPV1 and TRPM8 found on airway sensory nerves. HRV infection accounts for up to 50% of exacerbations in asthmatics,196 and both asthmatic197 and chronic cough sufferers198 ,199 have higher levels of TRP channels expressed in their airways. This finding adds to the mounting evidence that TRP channels play a major role in cough during HRV infections, but requires further investigation to definitively confirm this. The multiple mechanisms described above provide a confusing and inter-related ‘soup’ of potential therapeutic targets, dissecting which, are the key players involved in this common affliction that will be challenging. We suggest that modulation of the afferent neuronal hypersensitivity will provide the most fruitful target in what is essentially a benign and self-limiting disease. Other strategies, such as systemic immune modulation, run the risk of generating unforeseen off-target effects. The rewards for understanding the mechanism of viral-induced cough will have enormous impact on human morbidity.
. Developing antitussives the clinician's pipeline—what do we need? J Thorac Dis 2014;6:S735–8.
. Rhinoviruses as pathogens of the lower respiratory tract. Can Respir J 2000;7:409–14.
. Bradykinin and other inflammatory mediators in BAL-fluid from patients with active pulmonary inflammation. Agents Actions Suppl 1992;38(Pt 3):475–81.
. Prevalence of persistent cough during long-term enalapril treatment: controlled study versus nifedipine. Q J Med 1991;80:763–70.
. Sensory neuropeptides and the human lower airways: present state and future directions. Eur Respir J 1994;7:1161–71.
. Neuropeptides modulate human eosinophil chemotaxis. J Immunol 1992;149:3309–15.
. Substance P-associated increase of intra-articular temperature and pain threshold in the arthritic TMJ. J Orofac Pain 1998;12:101–7.
. Involvement of cytokines in lipopolysaccharide-induced facilitation of CGRP release from capsaicin-sensitive nerves in the trachea: studies with interleukin-1beta and tumor necrosis factor-alpha. J Neurosci 1996;16:4742–8.
. Increased acetylcholine release in tracheas from allergen-exposed IgE-immune mice. Am J Physiol 1994;266:L263–70.
. Oxidants affect permeability and repair of the cultured human tracheal epithelium. Am J Physiol 1995;268:L284–93.
. Rhinovirus infection induces mucus hypersecretion. Am J Physiol Lung Cell Mol Physiol 1998;274:L1017–23.
. Rhinovirus stimulation of interleukin-8 in vivo and in vitro: role of NF-kappaB. Am J Physiol 1997;273:L814–24.
. Muscarinic receptor subtypes in feline tracheal submucosal gland secretion. Am J Physiol 1992;262:L223–8.
. TRPV4 and activation of airway sensory nerves: the role of ATP. Presented at Pharmacology 2014 Basic pharmacology oral communications (VII). 2014.
. Tumor necrosis factor enhances the capsaicin sensitivity of rat sensory neurons. J Neurosci 1997;17:975–82.
. TRP channels in urinary bladder mechanosensation. In: Islam S, ed. 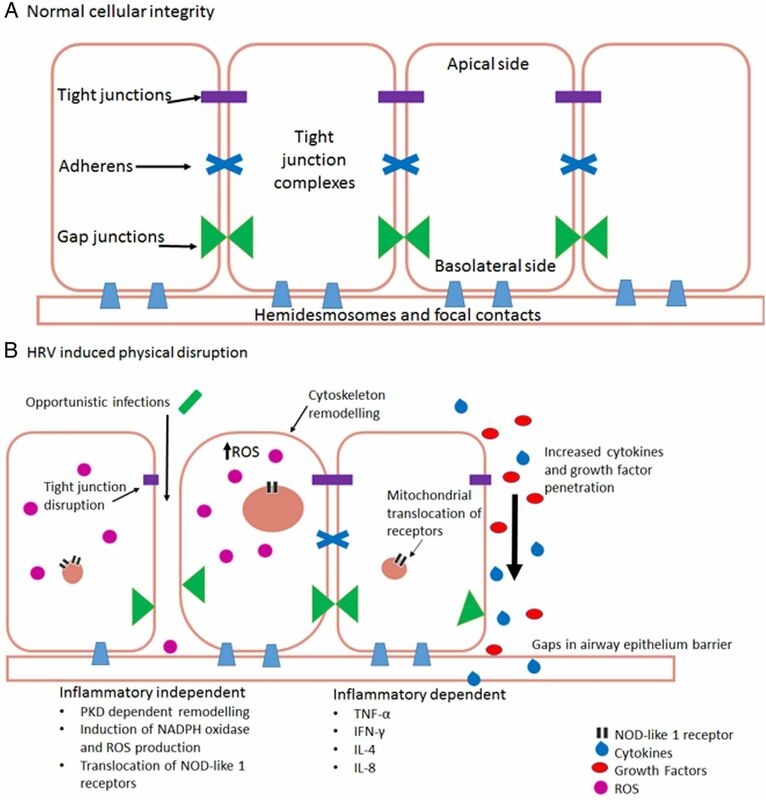 Transient receptor potential channels: advances in experimental medicine and biology, 2011:861–79.